What stands out to you about the chart below? It plots the growth of $1 invested in two distinct U.S. stock strategies starting June 30, 1926 and ending March 31, 2014. By the end, the hypothetical investor who put money in the top strategy would have over 1,167 times more money than the investor who threw away his capital in the bottom strategy (of course, this illustration ignores transaction costs and taxes). 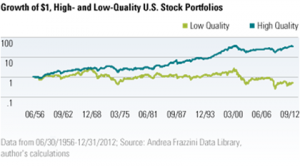 Who would want to invest in the volatile, underperforming bottom strategy? Not you, certainly. Yet that’s what countless individual investors do, spurred on by greed, fear, and envy. Human psychology is geared toward pushing you to the losing strategy. You may have guessed how these strategies differ. The top line follows a portfolio of boring value stocks. The bottom line shows a portfolio of exciting, speculative growth stocks. 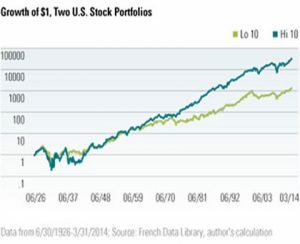 The historical record is clear: Exciting stocks are, as a whole, bad investments. As ho-hum as choosing underpriced stocks based on fundamental research may sound, value investing is an approach that stands up to scrutiny. Value investing isn’t new. Warren Buffett’s mentor, Benjamin Graham, pioneered quantitative value strategies in the early 20th century, and many of his methods are still being applied almost 90 years later. Graham’s practice of identifying winning rules-based strategies has been continued and refined, with investors identifying strategies that have performed over decades in diverse regions and markets. The discovery of these patterns, or “factors,” has made things tougher for active managers. Many only beat their benchmarks because they exploit factor strategies, knowingly or not. The most sophisticated studies find little evidence of manager skill after adjusting for factor exposures. Suddenly, there’s not much reason to pay for a manager whose performance can be matched by simple rules-based strategies.